SssstingStop Insect Gel / 2.75 oz - Nature's Way®. 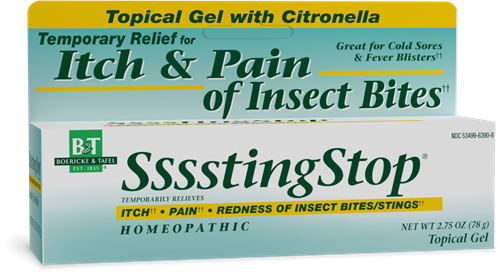 SssstingStop® gel with Citronella is for the itch, pain and redness of insect bites and stings.†† It contains no hydrocortisone, antihistamines, DEET or synthetic medicines. citronella oil, ethyl alcohol, eucalyptus oil, jojoba oil, polyacrylic acid, purified water, sodium hydroxide, witch hazel distillate. Stop use and ask a doctor if skin irritation, rash or other allergic reaction develops; condition worsens or does not improve within 7 days. These could be signs of a serious condition.